Discussion in 'Downhill & Freeride' started by jonKranked, Apr 4, 2019.
i felt like this topic deserved its own thread as some new stuff definitely is worth a look, so i didn't wanna toss it in another thread. yes, there's a lot of crap out there, but every now and then some cool stuff comes up. they figured out a way to remove the rollers from a chain and integrate that function into the outer plate. there's a thread in the shop forum on chainrings and one of the topics discussed was wear between chains and rings, and the part of the chain that actually wears out. the company making this chain claims the primary benefit will be improved durability / longevity of the chain, but stops short of claiming an actual amount of improvement. Replacing rollers with sliders? Sounds like content for another popular thread. Contact point for the ring/cog teeth isn't flat any more. Wonder if that will cause problems. This is where we post the latest improvements to e-bike drivetrains, right? Some people in the comments are talking about increased wear on the cog and cassettes. 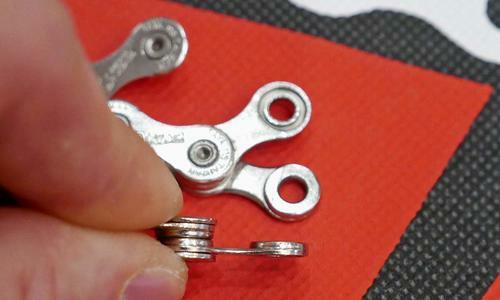 So, the chain may last longer but wears the other, more expensive components faster. For marginal weight savings, not sure its worth it. Yea, that's not how it works. "Why would one want ‘rolling’ bushings instead of non-‘rolling’ bushings? Mostly for sprocket wear. This is where I could use a better picture, but look at this basic one here 3, and picture that sprocket is being driven by an outside force causing it to rotate clockwise. On the top, the chain is contacting near the midpoint of the sprocket tooth on the bushing as the tooth engages the chain. The chain then gets pulled into the root between the teeth, and then comes back out on the slack side. With a bushing, this is all sliding movement between the bushing and the sprocket, causing more wear than if you had a roller." (...) The chain then gets pulled into the root between the teeth, and then comes back out on the slack side. With a bushing, this is all sliding movement between the bushing and the sprocket, causing more wear than if you had a roller. This is what makes me a fair bit skeptical about the claimed benefits in wear/durability. There is no bearing rolling down and up the tooth of the sprocket but a bushing sliding that slope. And we all know how perfectly clean those surfaces are in our field of application of chain drives. yea, there's definitely potential for increased wear by removing the roller / bushing from a chain (but they don't rotate as much as you might thing). but most wear to the cassette cogs / chainrings occurs from a "streched" chain (ie a chain where the rollers have worn down, which increases the space between them) when the chain doesn't sit where its supposed to; so they gears aren't wearing from friction but rather deformation due to the "stretched" chain. That doesn’t make sense, if only the rollers were wearing, we wouldn’t see the “stretch” between the pins when we measure a foot of chain. I want to test ride the scissor. You know I'm a jerk about HA, so that is the intriguing part for me. I equally want to make fun of anyone who shows up at my local riding one. I want to use one to crack walnuts. Thats looks over engineered. 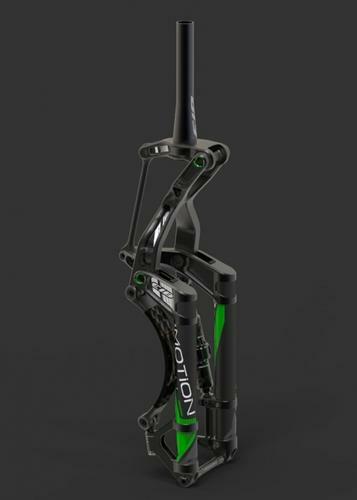 There are a couple shock forks on the market that simply replace the fork on your bike. Do they have a “static” head angle? I'd buy one and put a 36 on it. Then sell the fork on ebay cause nobody can buy it. Its like they blew their entire wad on the front of the bike. "sliding valve seat"? is this sort of like the twin-tube dampers? It is a puppet valve. Can't work....and once again PUSH doesn't offer it in Rootbeer. Total fail! Can I get a puppet valve for my 6*6? @Tantrum Cycles gave one of those a chance at Sea Otter. According to him thy have only one spring available. It has to be tuned to your weight with preload. Not ideal. "not ideal" is quite an understatement! They should learn how suspension works before building suspension. Combined bike/rider weight on an MTB could be as low as 120lbs or higher than 260lbs. But it's a carbon leaf spring. So carbon. This voodoo about the magical damping properties of carbon is tiresome. I found it interesting how the owner of We Are One downplayed it in that recent Downtime podcast interview.